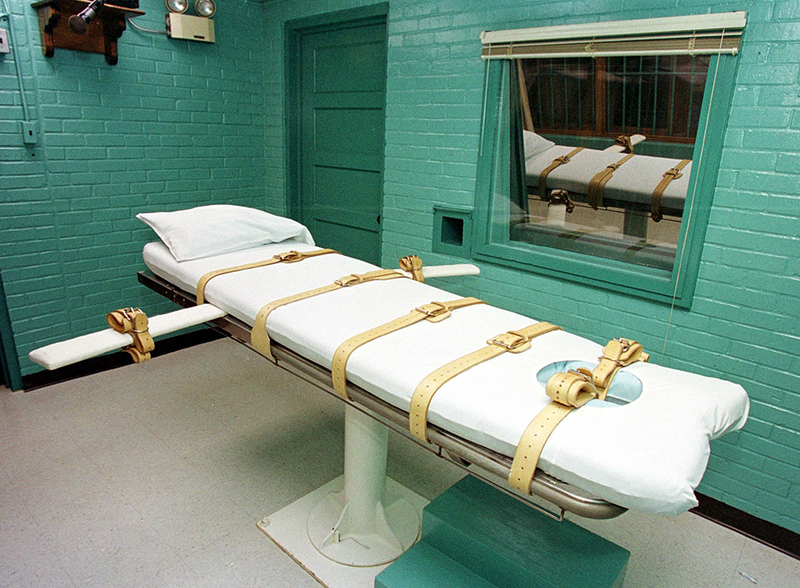 Vincent Cooks is scheduled to become the 256th person executed since 1976 in Texas on Dec. 12. Convicted of the robbery/murder of Dallas Police Officer Gary McCarthy in 1988, Cooks’ appeals have focused on scanty eyewitness testimony. Cooks has argued on appeal that only one out of ten eyewitnesses to the murder were able to identify him from a lineup, with a number of other witnesses identifying people other than Cooks. Eyewitness accounts have also given inconsistent judgements of the height and weight of the murderer. Some claimed he weighed approximately 220 pounds and was around 5′ 10. Cooks weighed 318 pounds at the time of his arrest and is 6′ 0. These facts were presented at trial and federal courts have sided with the jury. It is worth remembering that the eyewitness testimony of one person was enough to put Anthony Porter within days of an Illinois execution chamber- testimony that was later shown to be false. Porter has since been fully exonerated of the crime. Cooks has also suggested that the jury was unfairly motivated to see him as a violent and dangerous man. As evidence, he has questioned why his legs were shackled during trial. Previous courts have ruled that shackling a defendant in the court seriously damages the presumption of innocence all defendants are entitled to. Far from embracing this claim, federal courts have accepted the prosecutor’s rationale that it was not intended that the jury actually see the shackles. Moreover, at trial prosecutors misconstrued Cooks’ school record, claiming that he had to be removed from class so the rest of the school could function. In fact, Cooks was merely placed in a disciplinary setting for his truancy problem. The strategy of the prosecution to paint Vincent Cooks as an aggressive and violent person has worked to Cooks’ disadvantage. Federal courts repeatedly have denied Cooks’ contention that the jury was improperly prejudiced. Please write and call to let Gov. Perry know that convictions require evidence, not innuendo. As we continue to organize for a moratorium on executions in Texas, we are pleased to report that Sister Helen Prejean has agreed to serve on the Texas Moratorium Network Board of Advisors. Sister Prejean is the author of Dead Man Walking and Chair of the Moratorium Campaign based in New Orleans. She is a tireless activist on this issue both nationally and internationally, and we are excited to have her with us. 2ND ANNUAL MARCH FOR A MORATORIUM LESS THAN 2 WEEKS AWAY! The 2nd Annual March for a Moratorium is on schedule for Saturday, October 27, 2001, in Austin, Texas. This promises to be the largest public event ever to challenge the death penalty in the State of Texas. Over 1000 Texans are expected to converge of the Capitol to raise their voices for a halt to executions. Come to Austin and be a part of history! In violation of international law, the State of Texas is scheduled to execute Gerald Mitchell who was sentenced to death for a crime he committed when he was 17. Executing juvenile offenders is almost universally recognized as a fundamental violation of international law and is forbidden by the UN Convention on the Rights of the Child, which every nation on Earth has ratified except Somalia and the United States. Texas accounts for more than half of all the world’s executions of juvenile offenders in the last ten years. Under Texas law, the Texas Board of Pardons and Paroles has the exclusive power to commute a sentence of death to life in prison. Thank you for your continued support, and we hope to see many of you on October 27. The September newsletter contains information about cases to watch (Napoleon Beazley, Calvin Burdine, Max Soffar, and Andrea Pia Yates) as well as a speaking schedule for Sister Helen Prejean in Texas. We apologize that our newsletter is behind schedule this month. Like all Americans, we have recently been given to shock and mourning. But the need to stop executions in Texas is too important to for us to stop working. We also believe that now it is more important than ever to celebrate our democracy by pursuing reforms that will make it better, more humane, and more just. Since our last letter, in August, there have been several positive steps toward stopping executions in Texas. First, the plans for the Second Annual March for a Moratorium are rapidly progressing; people from all over Texas and beyond have said they plan to come (more on that at the bottom). Second, recent studies show that in Texas, and nationwide, the pace of executions is slowing. Texas had 40 executions in 2000. This year, it has had 13. Only three more are scheduled. This promising development comes just as two controversial Texas executions were stopped by the courts and civil rights groups are rallying to keep Andrea Yates off death row. -On August 15, the Texas Court of Criminal Appeals granted a stay of execution to Napoleon Beazley in order to consider whether his previous legal counsel had been effective. Napoleon, who is on death row for the Tyler murder of John Luttig, has been the subject of an international letter writing campaign because he was a juvenile at the time of his crime and his trial appears to have been marred by racism and bias. Thorough information on his case is available from the American Bar Association (http://www.abanet.org/crimjust/juvjus/beazley.html). Please follow their instructions on writing letters to the Texas Board of Pardons and Paroles. If Napoleon’s stay is lifted, the Board will be the last hope for stopping his execution. -Calvin Burdine, a death row inmate convicted in one Texas’ infamous sleeping lawyer cases, will get a new trial. The Fifth Circuit Court blocked his execution in late August. They concluded that unconscious counsel equates to no counsel at all. We await word of a trial date. -September 20 the Fifth Circuit Court hears oral arguments concerning the conviction of Max Soffar, who has been on Texas death row since 1981. Max’s was initially represented by the same attorney as Burdine (Joe Cannon). What is worse, there are serious doubts about his guilt. Last December the Fifth Circuit threw out Max’s 1981 conviction and death sentence but the state has since managed to convince the court to hear arguments en banc. Max’s case, involving a poor legal representation and a dubious confession, is another perfect example of what with wrong with application of the death penalty in Texas. It is one we need to continue watching. -Looking ahead to another highly controversial case, Texas Moratorium Network has joined with the ACLU, the National Organization for Women, and the Texas Coalition to Abolish the Death Penalty in support of the Andrea Pia Yates Support Coalition. Harris County Prosecutors have announced they will seek the death penalty against Andrea Yates for the murders of her five children. The Coalition believes that the death penalty is wholly inappropriate for her because she committed her crime while suffering from postpartum psychosis. The Second Annual March for a Moratorium is shaping up to be a huge success. On Saturday, October 27, moratorium supporters from all over Texas and beyond will gather in Austin at Republic Park (5th and Guadalupe) at 1 PM. We will march to the Capitol at 2PM. At 3PM will hear speakers on the steps of the Capitol. Committed speakers include State Representative Harold Dutton, Jr., author of House Bill 720 (to enact a moratorium), Deborah Bell, president of Texas National Organization for Women, Will Harell, executive directive of Texas ACLU, and exonerated former Texas death row inmate Kerry Cook. Word about the march is traveling fast. We have heard from marchers coming from such diverse places as El Paso, Boston, and Washington, D.C. By the end of October, e-mail and print announcements should have reached nearly twenty thousand Texans. More information, including contact information for travel coordinators, will posted to www.texasmoratorium.org. For the moment, Annette Spanhel (Aspanhel@yahoo.com) is offering camping space on her ranch in Dripping Springs (45 minutes from Austin) for students or anyone who needs to travel to the march on a tight budget. Please join us in making this the biggest moratorium march Texas has ever seen. Some of our best allies in the legislature were on our side because constituents pressured them from even before the session and refused to let up. We believe that if constituents keep reminding their legislators of the facts–with letters, phone calls, visits, photo-copies of newspaper articles–that legislators will become moratorium supporters. What we need now is dedicated volunteers all around the state to “adopt a legislator” and to focus on turning that legislations into a moratorium supporter. At time of writing, we have 1 year, 150 days, 2 hours, 2 minutes, and 37 seconds left until the beginning of the next legislative session. The Texas Moratorium Network considers this no time to rest! In the last session your letters and phone calls to legislators helped create a climate that made important reforms possible, reforms like post-conviction DNA testing and improvements in indigent defense. And moratorium bills took the lead in this progress. As The New York Times put it, A new found willingness of legislators to consider (death penalty reform) became apparent when bills to impose a moratorium passed out of committee, before eventually dying. Such bills had never even been given a hearing in the past. In other words, you made a difference. We know it was heartbreaking when Governor Perry vetoed the ban on execution of the mentally retarded, but we think that’s a decision he may live to regret. 1. Monthly newsletter – ask family and friends to join! During the session, this e-mail list was used for legislative action alerts. For the interim, we would like to continue to use it as a monthly newsletter. We believe that the better informed Texas moratorium supporters are, the more effective they can be in putting pressure on legislators and media. We promise that we will issue a newsletter no more than monthly (within the first week of the month). It will contain only information relevant to the death penalty – and efforts to stop executions – in Texas. By limiting the letter’s scope in this way, we hope to be brief but useful. If you ever wish to remove yourself from this list, explanation of how to do so is included at the bottom of every message. On the other hand, if you know others who would like to be added to the list, please refer them to our Web site, texasmoratorium.org. They should click on Join E-mail List. Some of our best allies in the legislature were on our side because constituents pressured them from even before the session and refused to let up. We believe that if constituents keep reminding their legislators of the facts –with letters, phone calls, visits, photo-copies of newspaper articles –that legislators will become moratorium supporters. What we need now is dedicated volunteers all around the state to adopt a legislator and to focus on turning that legislator into a moratorium supporter. Would you be interested in adopting your Senator or Representative? Would you like more information about how to contact your legislators and to encourage them to take a stand in support of a moratorium? Please contact Legislative Coordinator Brian Evans (bcevans@mail.utexas.edu; 512-302-6715). August 15 Texas is set to execute Napoleon Beazley for the 1993 murder of John Luttig in Tyler, Texas. His case is a potent reminder of why Texas needs a moratorium. Napoleon was seventeen at the time of his crime. The United States is among a small minority of countries that still has not banned execution of juvenile offenders as a human rights abuse. Napoleon’s death stands to be especially tragic because the Texas legislature nearly established such a ban. House Bill 2048 passed the House and then stalled in the Senate. In addition, Napoleon, who is African-American, was convicted by an all-white jury, one of whom was later quoted making an openly racist remark. Many who know Napoleon insist that he has great potential for rehabilitation, but his trial judge severely limited testimony about his character in his sentencing hearing. The injustice of this execution has been discussed by an in-depth report by Amnesty International (Too young to vote, old enough to be executed, http://web.amnesty.org/ai.nsf/print/AMR511052001?OpenDocument). We urge you to read more about this execution and to take action against it. E-mail appeals to governor Governor Perry can be made online. The office also maintains the Governor’s Opinion Hotline for Texas residents. The telephone number is 800-252-9600. Last year’s moratorium march brought over 700 marchers from Texas and beyond to protest then-Governor George Bush’s horrendous record of executions. 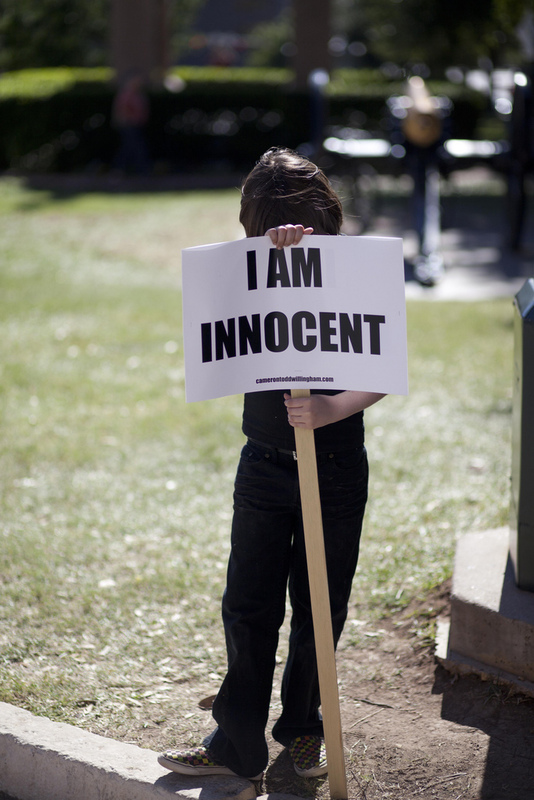 It may well have been the largest public protest of executions in the history of Texas. This year’s march promises to be bigger. During the legislative session, Governor Rick Perry showed his uncritical support for the death penalty by vetoing even a modest reform to ban execution of persons with mental retardation. Come tell him he is wrong. It’s time not only to ban killing the mentally retarded, but to halt Texas executions altogether. The march is being planned by an Austin-based steering committee with members representing a wide array of activist groups. To contact organizers, please call Texas Moratorium Network at 512-302-6715. More information and up-dates will posted to texasmoratorium.org. The campaign for a moratorium in Texas is strong and getting stronger. Don’t miss the chance to be part of history. Moratorium now!